As an educator, you've most likely heard of DonorsChoose.org. It's a website that allows teachers to post their classroom needs, and donors to select the projects and classrooms they want to help. The goal is that all students will have the tools and experiences they need to excel. DonorsChoose was started by a teacher who realized the cost of purchasing supplies and equipment wasn't always feasible. He thought there might be donors out there who would love to help and see children succeed, and he was right! After the first few posts from his colleagues, the site spread nationwide and it's available to every public school in America. Why Start a DonorsChoose Campaign? Starting a DonorsChoose campaign is easy and it works! 73% of schools in America have posted a project on the site. Because of that over two million individual and corporate donors have found a project to help fund. They have given over four million dollars in classroom project funding so that students can have the best education available. Need more reasons to start? It's simple to set up an account and start your first project. It's transparent, which is important for both donors and teachers. There are excellent gift-matching opportunities. Here's an example to show how the program works. Check it out for yourself to see what the project webpage looks like from a donor's perspective. 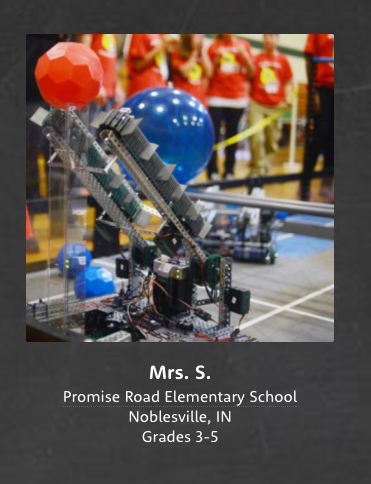 This elementary school wants to start a robotics team. They were given a grant that included a starter kit, but in order to officially have a team, they need competition fields and accessories. The teacher provides background information and a price list of everything that is needed. Donors can see all the details and will know exactly what their donation will be funding. Now that you've seen how valuable this resource can be, it's time to get started! Just click "Start Your First Project" at the top of the home page (donorschoose.org), or start here. You will need to create a teacher account first. Next, follow the simple step-by-step instructions for creating your first project. What kind of project is it? Standard, Student-led, Teacher development. Not sure? If you're shopping for classroom materials and your students aren't leading the project, pick Standard. You can change your project type later, if necessary. Who's involved? Be prepared to describe your classroom, introduce your students, and have a quality photo or two to upload. Get ready to shop! You can pick out exactly what you need for your project using the vendors on the site. Be prepared to do some shopping and get specific on your requests. Why is this important? Be ready to explain why this project is vital to your students, how it will make a difference, and identify 2 subject areas that will help donors find your project. For further tips that will enhance your project, read the DonorsChoose help documentation. 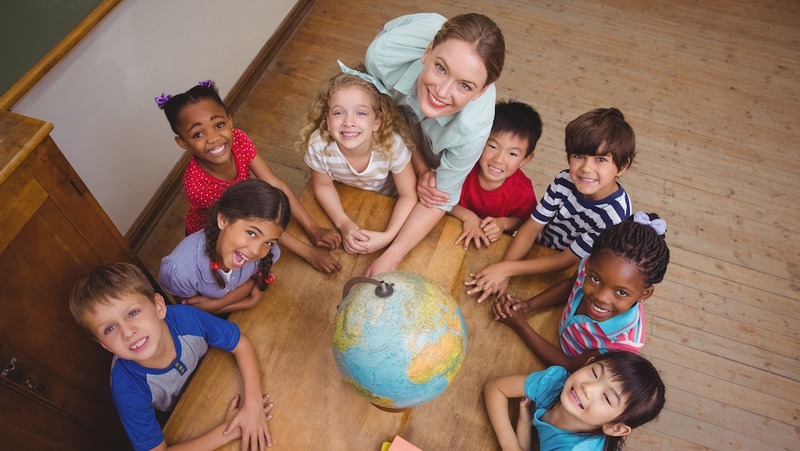 Now that you have created a project for your classroom, it's time to tell the world! 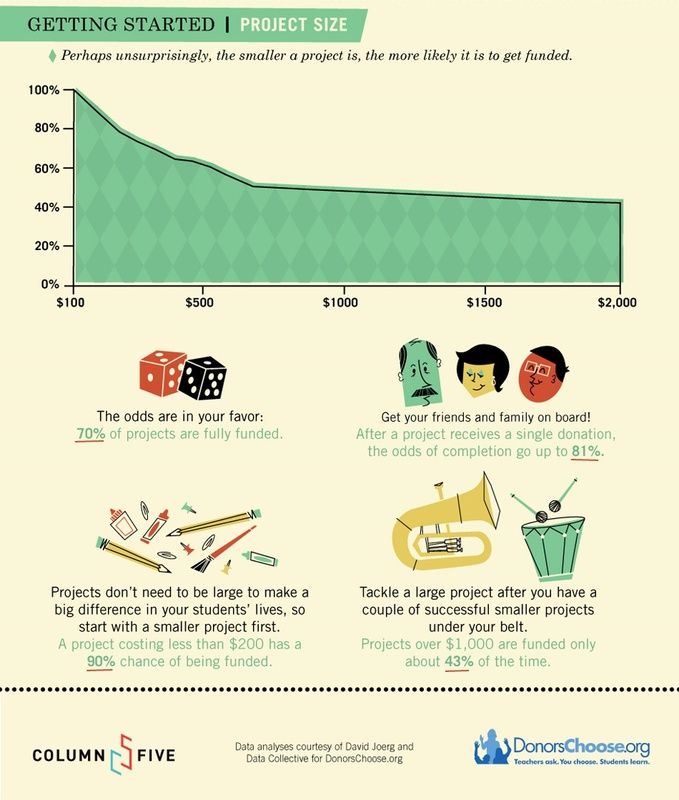 There are several ways you can promote your project. Here are a few to get you started. Use your public profile on the DonorsChoose site. Share your link with everyone and tell them to check it out often to keep up with the latest events in your classroom. Share your custom URL on Facebook and allow Donor's Choose to automatically post on Facebook on behalf of your project. Share your custom URL with friends and family. You might be surprised how many people you already know will want to help your project take off. Share your project within your community. Rotary clubs, small businesses, local media, PTA's and many other organizations are happy to support teachers. If you have experience with DonorsChoose.org, please let us know! We would love to hear about your successes and lessons learned.